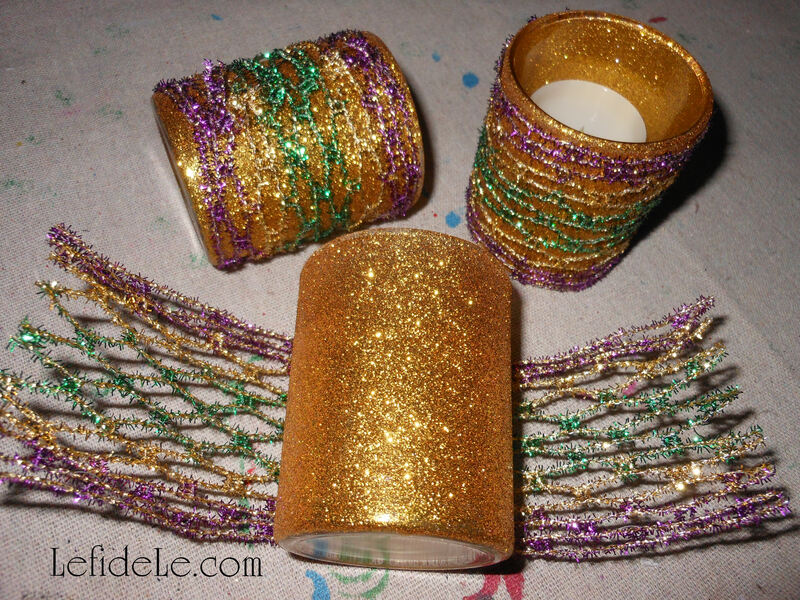 Create your own elegant Mardi Gras themed glittered napkin rings for mere pennies with this fast and easy craft. 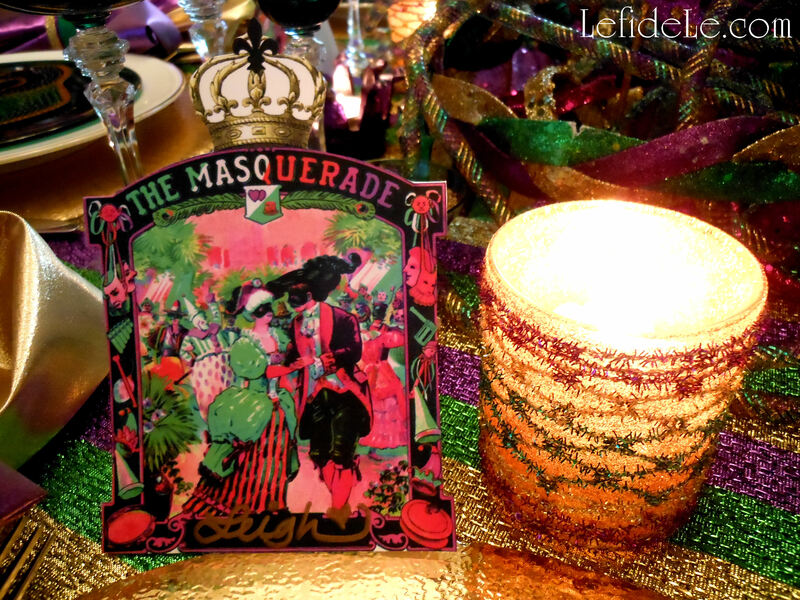 The tutorial includes how to embellish votives to match your theme, free masquerade place-card and invitation printables, plus more details on the centerpiece from the Mardi Gras Masquerade Themed “Fat Tuesday” Dinner Party Tablescape Décor Ideas. 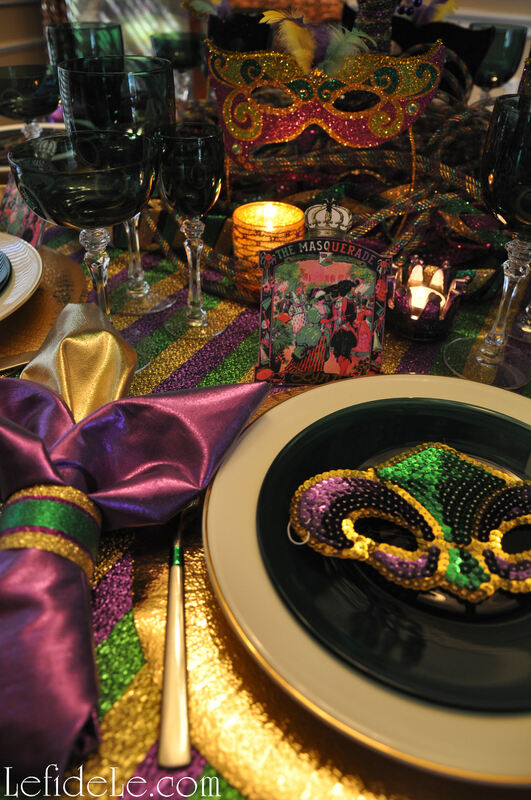 These DIY projects are an easy and inexpensive way to bring the look of an authentic Krewe’s fête to your own crew! 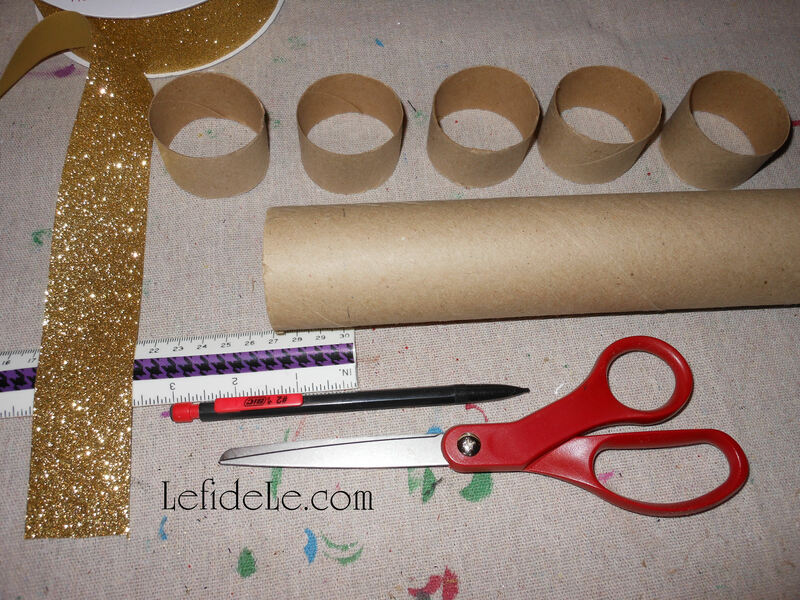 The secret element to an inexpensive napkin ring form is the core of a wrapping paper roll. You can’t do better than free! 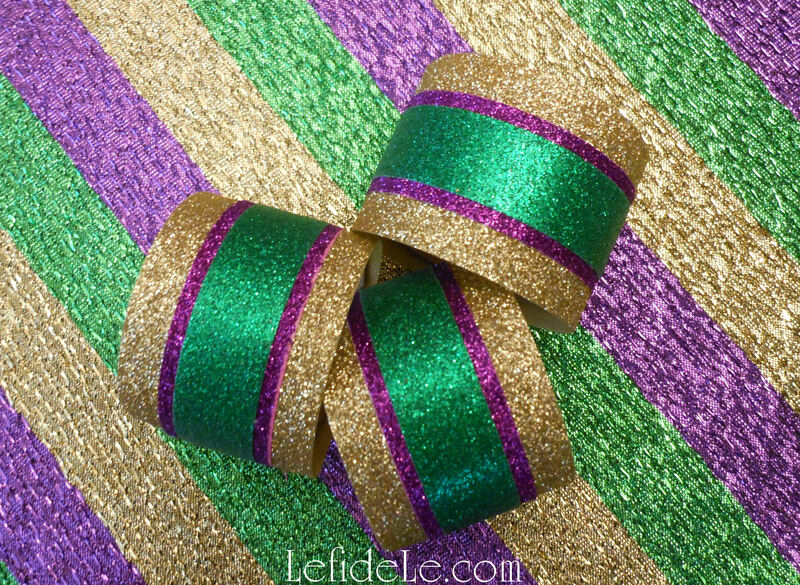 Mark and cut sections that are smaller than the ribbon you choose to cover it with. 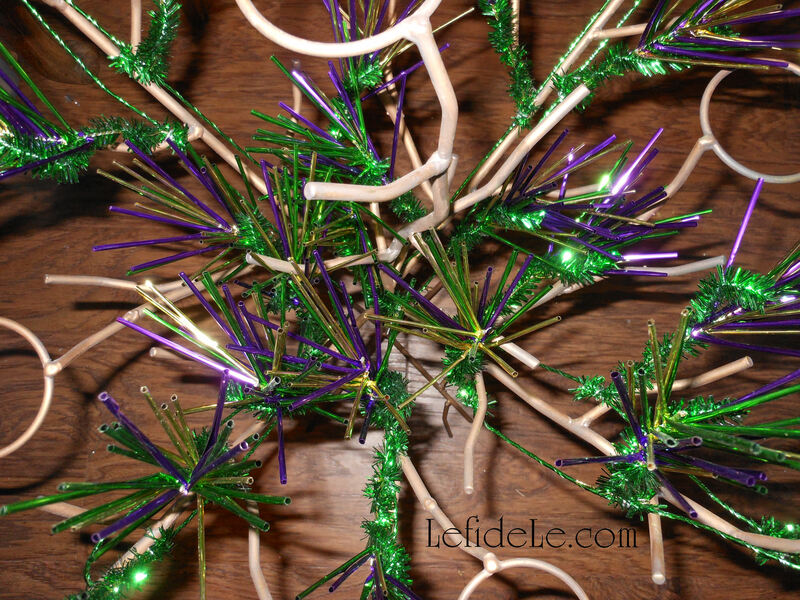 Then cut lengths of ribbon long enough to wrap around those cores. 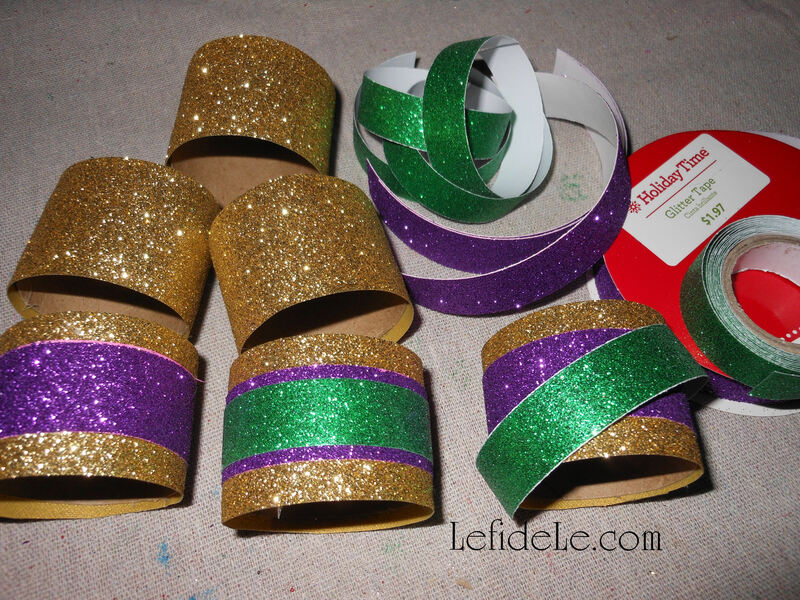 Next, I cut and attached layers of green and purple glitter washi tape in different widths atop the gold base. 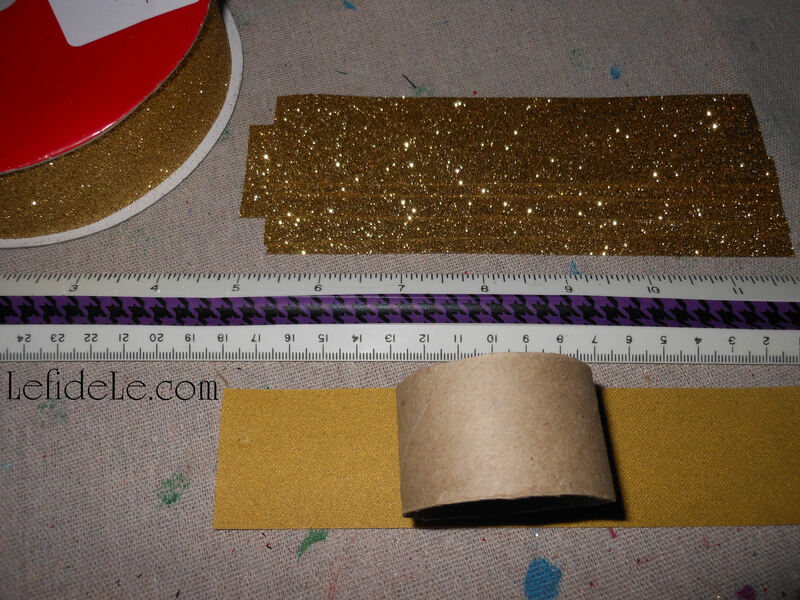 Layers of ribbon would have also worked well, but I already owned the perfect sized tape. 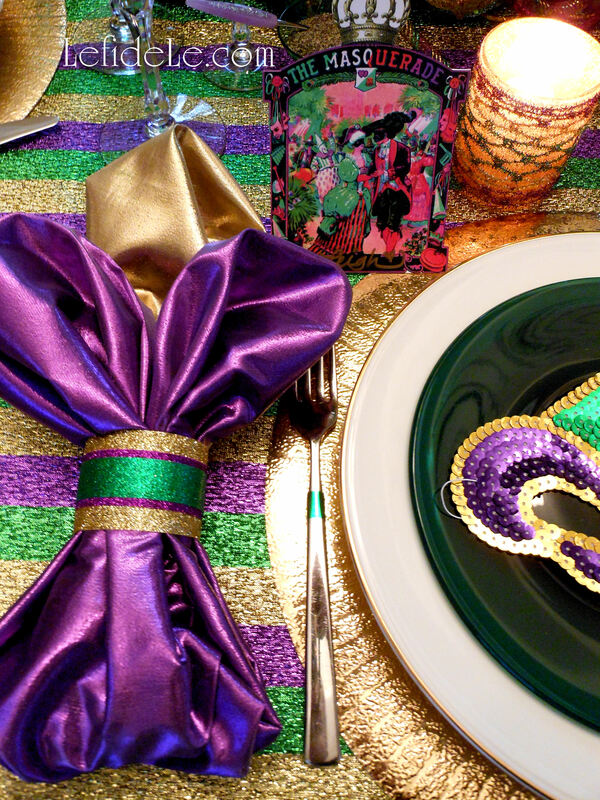 Read how to make your own fleur-de-lis shapes with napkins at the article on Mardi Gras Masquerade Themed “Fat Tuesday” Dinner Party Tablescape Décor Ideas. 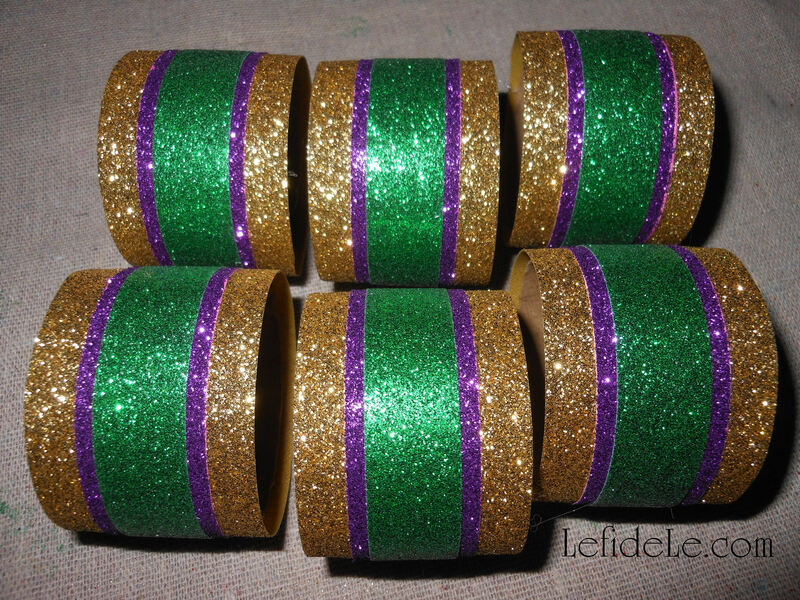 I made all six napkin rings for way less than a dollar, in a matter of minutes, and they coordinated perfectly with my theme’s décor… Awesome! In this way, I can unwrap the ribbons and reuse both them and the votives for a future holiday in a different way. I think they turned out great, and they literally took me minutes to complete… Yea! 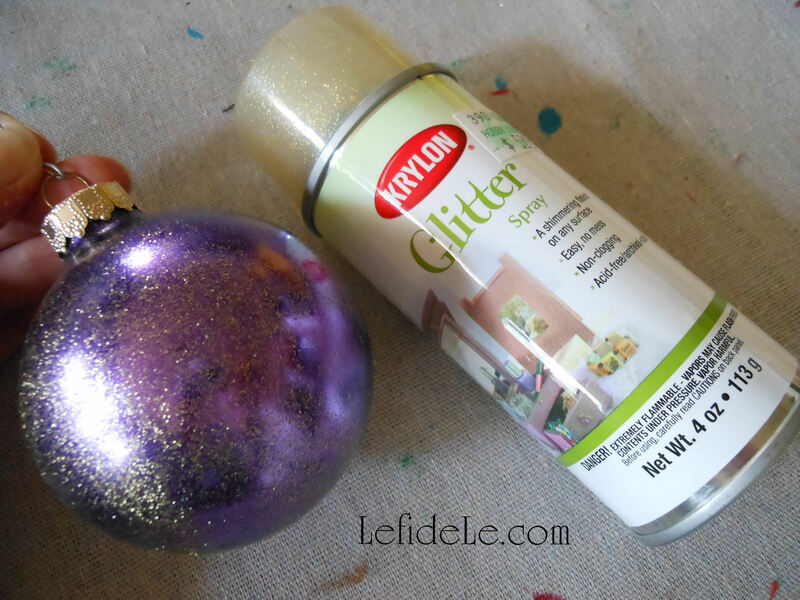 I wrapped it with trim from my Glitter-ween Party Décor (see it here) then added a few new sprigs. 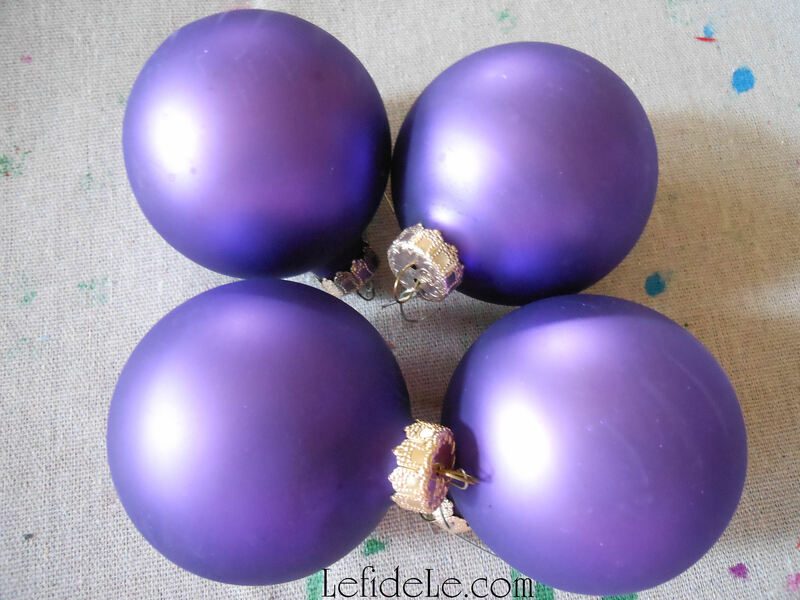 I painted simple purple ball ornaments with a glitter mist (not the blast variety) to impart both gloss and glitter shine to the previously satin sheen. 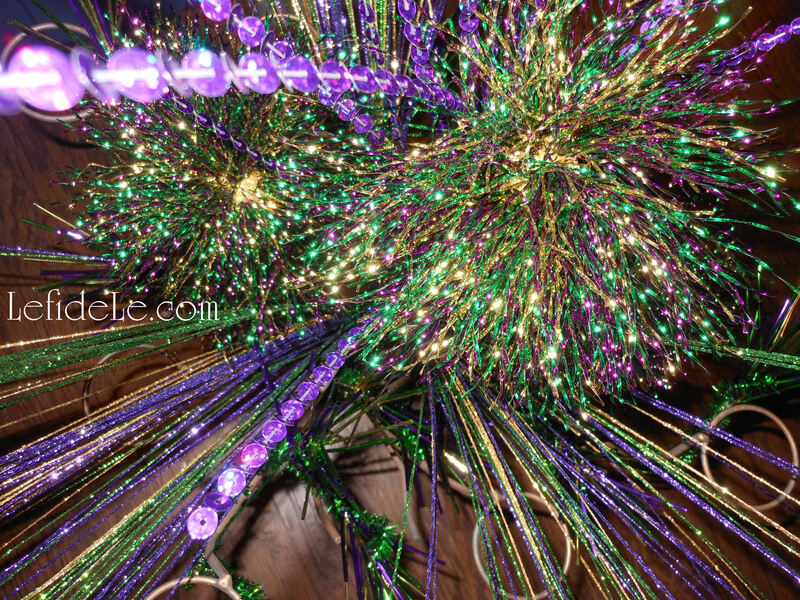 I hung embroidered Christmas crown ornaments, snapped up at 10 cent clearance, along with glittered musical instruments, green mirror balls, and a mask garland. 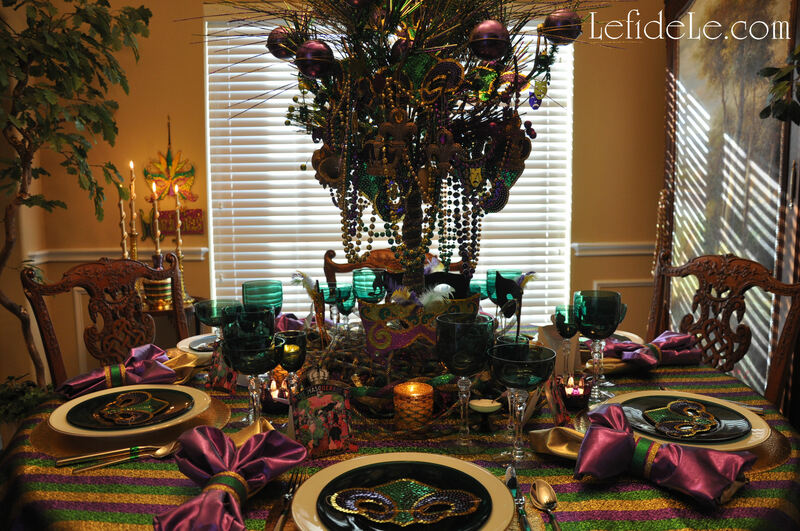 I even hung the same sequin fleur-de-lis masks used at each table setting as ornaments. I try to plan all my holiday themes I advance of the after Christmas sales to snag a year’s worth of décor deals at 90% off. I keep my theme collections in labeled bins that I add to as I accumulate finds so that I’m ready to craft and decorate when each holiday arrives. 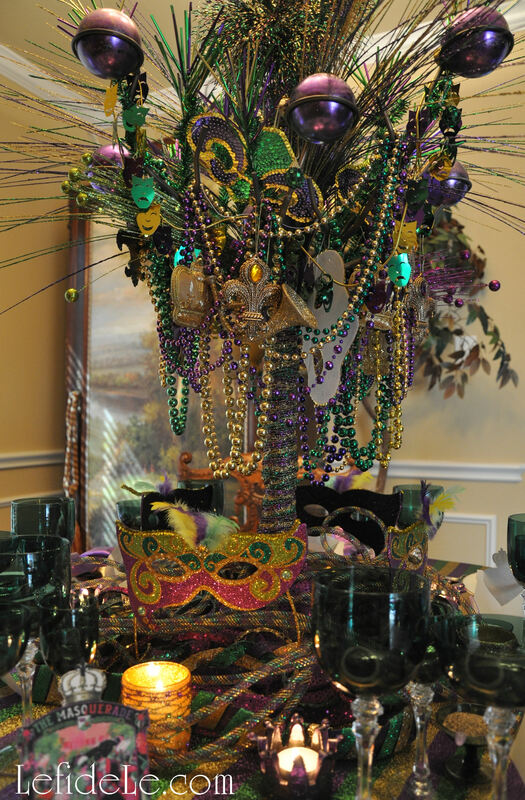 Though it’s hard to tell from the pictures, the tree centerpiece actually didn’t obstruct any person to person viewing. 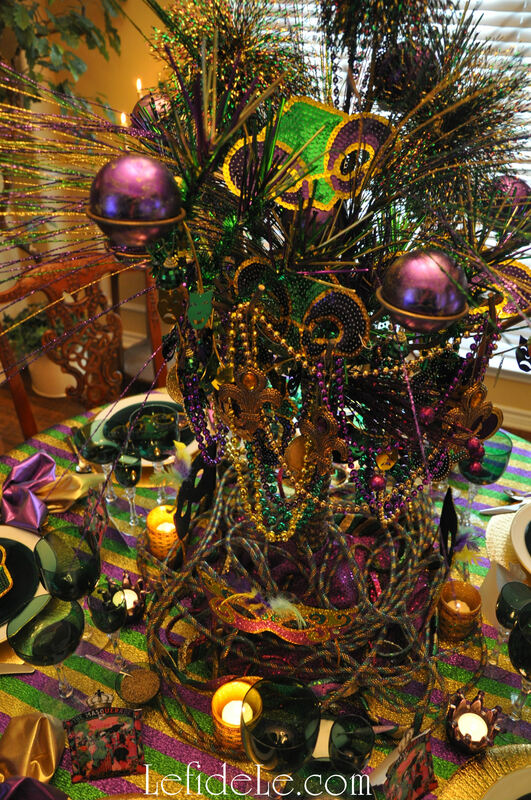 This is why I only draped the bottom with some Mardi Gras necklaces and wrapped the trunk with the same ribbon I used on the votive holders. 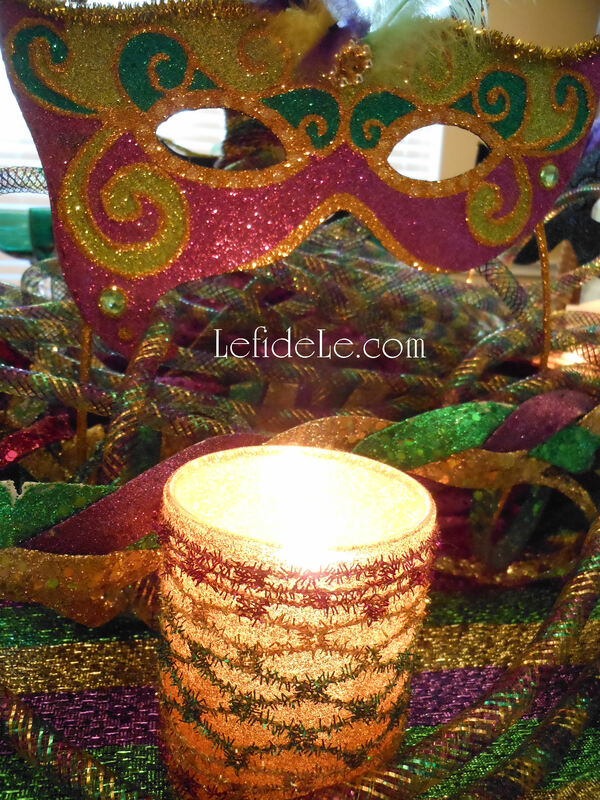 Surrounding that are 4 standing glittered metal masks that I scored at a post-holiday clearance sale for less than 2 dollars each… no kidding folks. I couldn’t have made them for less. 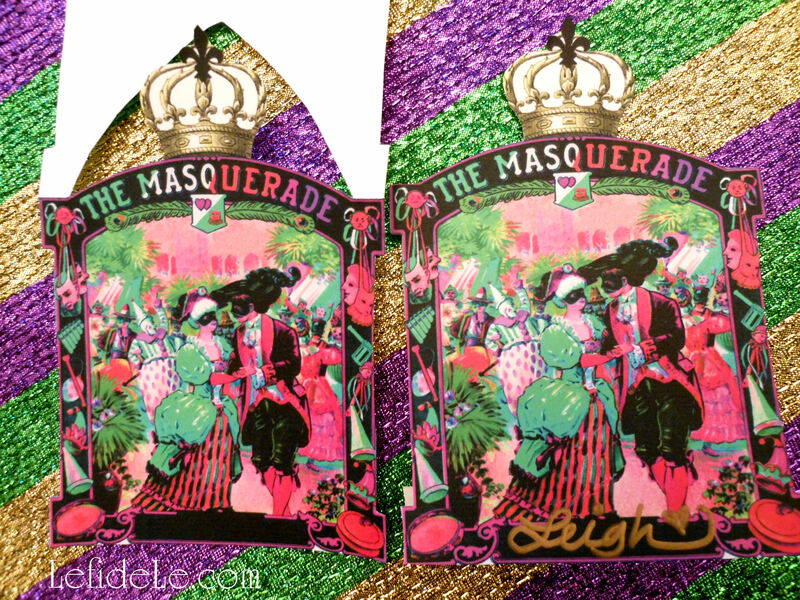 To do as I did, scope out this year’s merchandise then pounce as soon as it gets marked down. 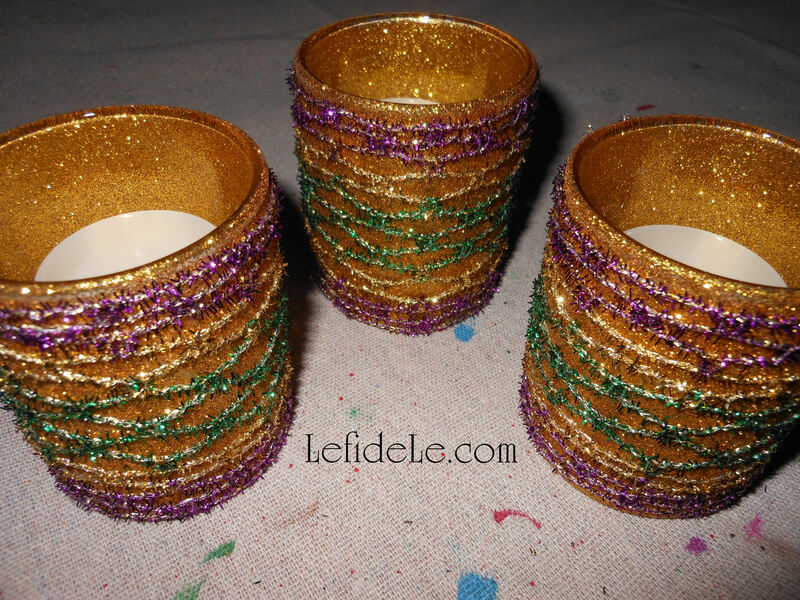 The purple mercury glass crown votive holders were also found this way for less than a dollar for all 3… Score! 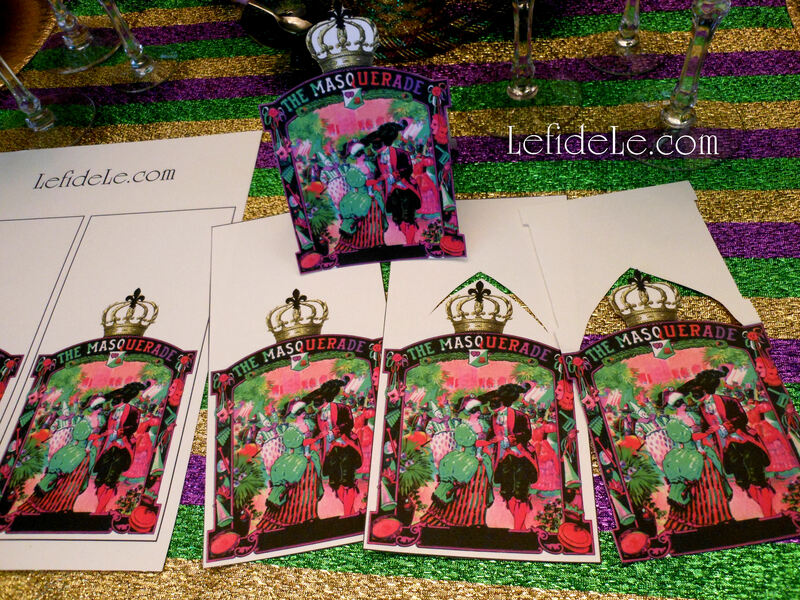 Last but definitely not least, are my free printable Mardi Gras masquerade place-cards which may also be used as invitation cards! Simple right click on this small picture and select print. Print these in best color photo on thick cardstock. 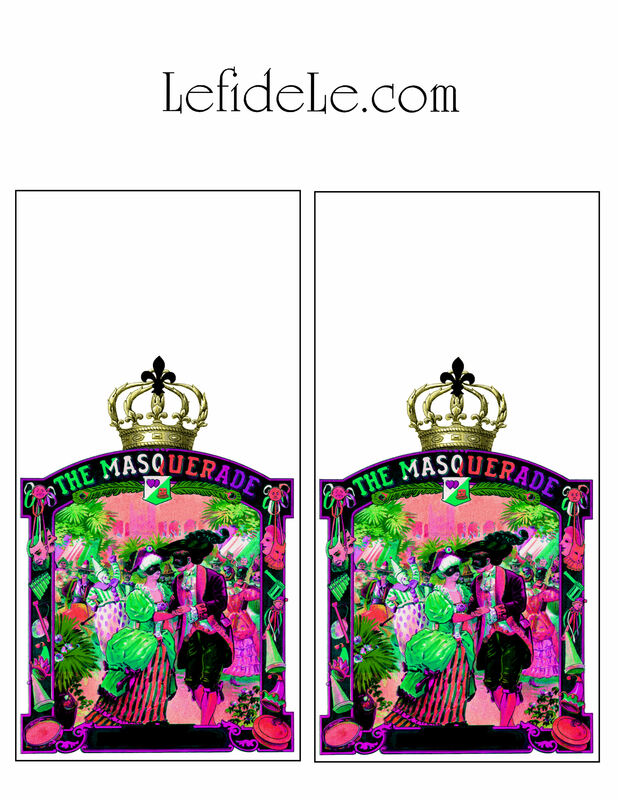 Then simply cut on the solid black lines to separate the images for invitations. 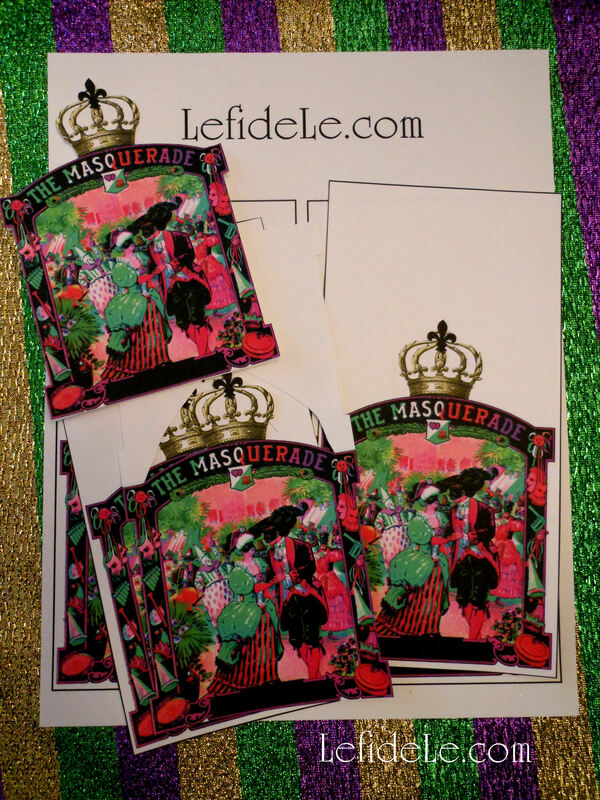 For place-cards, use the pictures a guide for how to cut out the top and crown while still making a tent folding card that will stand upright. Poke a point into the paper just above the crown with a pointy pen, or compass point, etc. Use that as a starting point for your scissors to cut a V shape above the picture. Then cut one side close to the top and crown next to the image. Don’t cut all the way to the ends. Stop where the curve meets the flat top. Those flat parts are what join the front and back together. Then fold it in half. Cut through both pieces around the image. Again, a picture speaks a thousand words… use it as a visual guide. 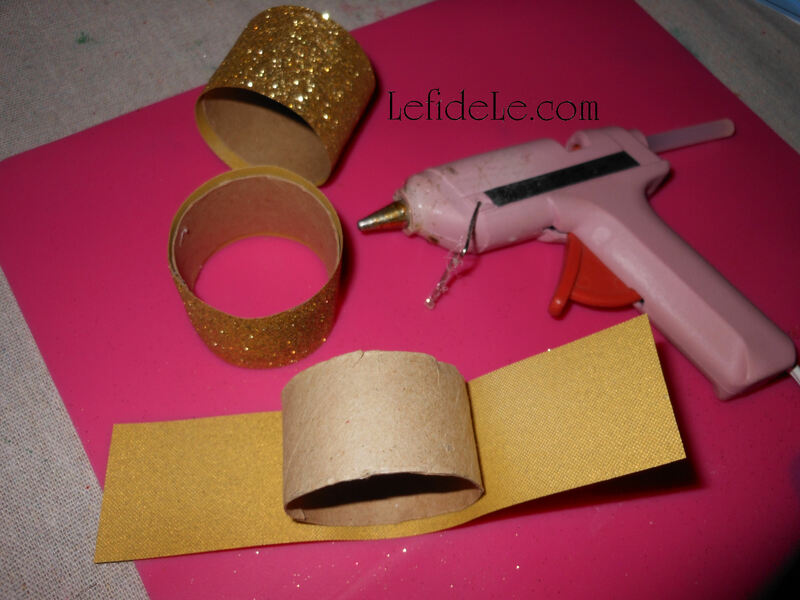 Simply write names on the bottom with a gold sharpie marker or paint pen… Voila! 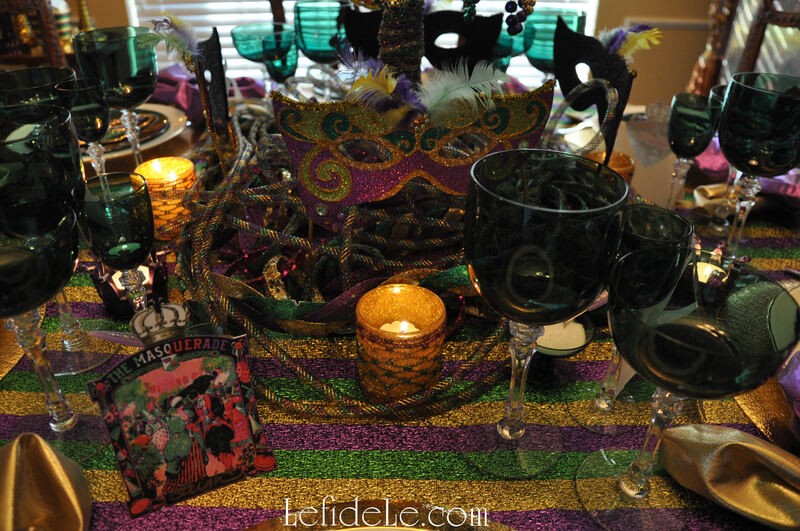 See more of my Mardi Gras Masquerade Themed “Fat Tuesday” Dinner Party Tablescape Décor Ideas here for more holiday inspiration!